Use Semonto's server monitoring tools to tests the availability of your business critical servers. If something affects their availability Semonto will alert you immmediatly so you can respond quickly and avoid unavailabillity of your services. Use the ping and latency test to verify if your website is reachable at all and if it responds within the given timeframe. Semonto can test if required ports accept a connection and make sure your applications are availlable. Semonto offers a wide array of pre-defined extended test for your servers. This requires a small web-application that needs to be installed on your server. This web-app will receive HTTP GET requests from our test-servers and will execute each test. This tool can be limited on IP-level and will prevent that Semonto need to run as root or takes unneeded resources on your (production) servers and can be adjusted to your current server setup. Get an overview of the server load (now/5min/15min) and be alerted when it passes a threshold. Watch the server storage usage so you can interact when you are running out of space. Test if a database can be reached, and if a simple query can be excuted. Test MySQL/MariaDB/Postgres databases and more. Checks if your webapp interpreter is working correctly. If you need more support on this, feel free to contact us on this. When you monitor a large amount of server, tagging them can make it easier to show only the status of the servers that you need at that moment. You can define how you want the be alerted for multiple servers and webapps once. This makes managing it much easier. 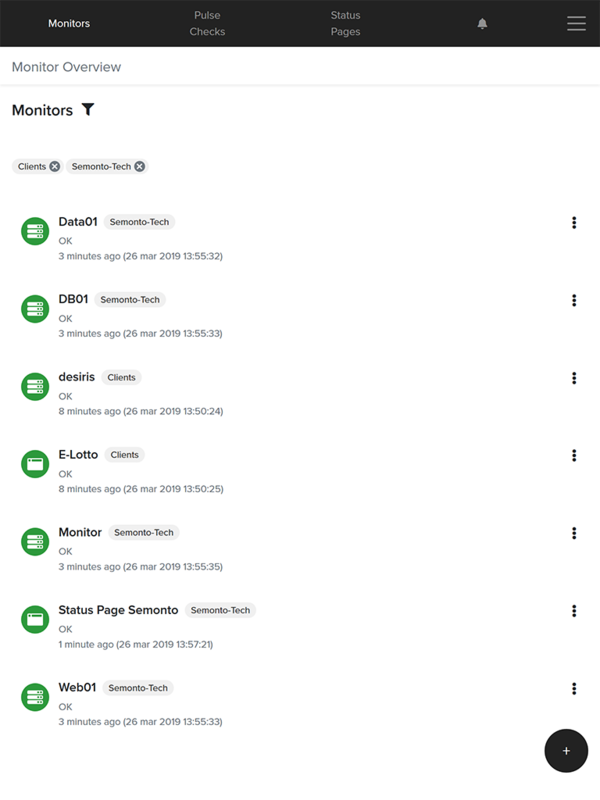 Semonto keeps an overview of all excecuted tests and presents them as uptime reports. Get a detailed and easy overview of all the default and custom tests.